We sell thousands of different style calendars here at Calendar Lady Promotions. 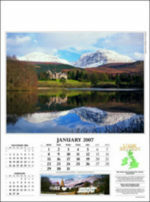 Everything from glamorous girl calendars to scienic, landscape pictures of the English, Irish and Scottish country side. Other promotional and personalised items besides our Calendar with logo click here. To find out more about our Calendar with logo click here and fill in the contact form and we'll get straight back to you. So whichever customer you give your Calendar with logo too, and whatever wall it ends up hanging on. It will always be displaying your company details and logo! So advertise your details on our Calendar with logo today!